We started off planning to make a Bargain Hunt reference in this week's Deals post but that ended up with us spending way too long on Wikipedia picking up useless David Dickinson trivia, so let's just get straight into the deals. One deal that caught our eye this week is the Epson Expression Home XP-305 printer - a Wi-Fi enabled printer, scanner and copier with LCD screen which is currently on sale at Amazon for just £49.99. That's a saving of £30 off its usual price of £79.99. 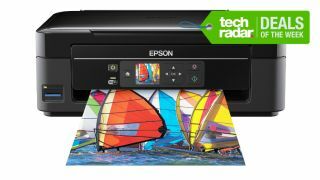 The Expression Home XP-305 is part of Epson's smallest ever range of all-in-one home inkjets and brings the added benefit of Wi-Fi connectivity and an LCD. The printer comes with Epson Connect, making it easy to print documents and photos wirelessly from smartphones and tablets, while you can also print remotely by emailing documents directly to the printer. The XP-305 also supports Apple AirPrint ready and Google Cloud Print. Another item that we recommend this week is the Netgear WN3000RP Universal Wi-Fi Range Extender at a saving of 45% on Amazon. If you get frustrated by your wireless connection dropping out as you get further away from your router then this plug and play £39 device could be the answer. It works with any wireless b/g/n router and all security standards including WPA-PSK, WPA2-PSK, mixed mode and WEP. Read on for more top deals.